From the early 1960’s to the present day, the evolution of the computer generated image (CGI) has progressed from the earliest line drawing computers (Ivan Sutherland’s Sketchpad (Fig. 1)(Wikipedia) to the hyper real computer game. Since then advancements in vector graphics and computer algorithms (Cartesian co-ordinates, Bezier curves, shading, ray tracing, texture mapping and light source modelling) brought computer image making to the present day where a computer generated image could momentarily be mistaken for the real thing (fig. 2 and 10). As with most computer related advancements; fields like the military, architecture, engineering and film may have funded and accelerated the speed of these developments. Films and the representation of the world through science fiction have long overtaken science fact and with that the expectations of audiences everywhere for what entertains and looks real. It begs the question; does this standard of realism add anything to any field of knowledge? 3D visualisations (some photorealistic, some not) and the animated fly-through have become standard storytelling devices in historical documentaries. It could be argued that this is driven more by technological advancement and audience expectation than by specialists in cultural heritage. This blog will look at the history of photorealism followed by an exploration of the debate around the effect of using photorealism in the field of Archaeology. Photorealism has a long history. Before the invention of photography, it was the mark of an accomplished painter to be able to capture the difficult textures of of glass, pewter and lemon accurately in paint (fig. 3). Early painters used the trick of the eye that is achieved by photorealism to create fantastical landscapes and to assemble components or characters that have never occupied the same space but can be photorealistically united on a canvas (fig. 4). Fig. 3 – A Roemer, an Overturned Pewter Jug, Olives and a Half Peeled Lemon on Pewter Plates by Pieter Claesz. (c.1597 – 1660).Photo Sotheby’s. Fig. 6 – Diorama with Alaskan Brown Bears. The American Museum of Natural History. New YorkSource: Google Images. The field of archaeology has used ’the artists impression’ and non-photorealistic visuals as tools since the 1880’s. The use of illustration in this context has been strictly interpretative (Bateman 1). Areas of interest could be highlighted whilst areas of uncertainty could remain ambiguous. Strothotte et al. (qtd. in Frankland 27) compare it to the ‘roughs’ or sketches made by architects as part of their visual thinking process(456). Roughs are a way of allowing an architect to make up their mind, to work through the possibilities without committing to only one. (Ibid.) this non-realistic visualisation process has served archaeologists as well. It seems that both archaeologists and the public find that ‘meaningfully abstracted’ visuals prompt greater audience engagement (Frankland 26). Frankland surveyed a mixed group of cultural heritage specialists and non-specialists. His aim was to measure their preference and types of engagement with photorealistic and non-photorealistic visualisations. When the surveyed group had to choose a visual they thought suitable for display in a visitor centre, the majority of the group chose the photorealistic option for this purpose. It seems that even when there was a clear reluctance on the part of the cultural heritage specialists amongst the survey group about the ‘truth’ of these particular photorealistic renderings (for example, how could archaeologists have any evidence for how the roof of a crannog would be structured?) when given a choice about which they preferred, the majority chose photorealistic option (Ibid.). Non-photorealism will be discussed in more detail in Blog Post 2(BP2). Computer visualisations can aim for a hyper level of realism but unlike reality, visualisations have no ‘real world’ constraints. ‘The trend for images to represent ‘entire’ interpretations, to be pictorial compressions of time, ensuring that all activities and artefacts are represented, has given the entire genre a vulnerability to attack.’ (Bateman 1). ‘If anything, the perception of the magical mysticism of information and communication technologies is increasing as the number of layers of abstraction between human user and machine multiply’(Huggett 85). In support to these arguments Buczynska-Garewicz adds, in relation to the 3D visualisations of ‘Cerveteri Reborn, ‘There is no ground to believe that the new construction is the real thing, while it is only ‘as if’ real. So, there is a dangerous illusion created by 3D visualisation’ (paragraph 7). Eiteljorg warns against being misinformed by ‘A good image’ which he describes as ‘truly a double edged sword’(4). All of these arguments urge caution on the part of the viewer/interpreter as better illustration is not necessarily a better argument (Ibid.). The technical lineage of the software used for archaeological visualisations may explain a lot about why they can look like illustrations of ‘socially empty space’ for the lack of people represented (Fig.7+8)(Bateman 4). ‘This impression of absence is also a distinct characteristic of the media of delivery of these visualisations’ (Ibid.). This could be an instance that reinforces Walter Benjamin’s assertion about the loss of ‘aura’, or in this case a true sense of time and place, due to mechanical nature of the method of production. (Benjamin 218-9; Bateman 4) Remedying this absence; whilst keeping the image historically accurate, and site specific, brings up new issues. Introducing suitably dressed and occupied human forms into a 3d visualisation, adds to the list of what needs to be historically verified. Apart from slowing down rendering speeds, adding a lot of modelling and putting the visual in danger of looking fictional, it diverts efforts away from focussing on the archaeological site. Fig. 8 – Digital Karnak Project 2006-2008. ‘We must not allow ourselves to use the technology to do half the job if doing so misleads’ (Eiteljorg 6). This quote was written in 2000, and as with most of the authors cited in this post, it pre-dates the writing of the London Charter in 2006. It gives a taste for the concerns expressed at this time about the lack of transparency and ’the epistemological problems posed by hyperrealism,'(Denard). Furthermore it shows the background against which a set of principles was deemed necessary. Photorealistic CGI was proving itself very popular, and due to the powerful inertia (Molyneaux 7)of this style of image, was considered a potential mask for the presentation of erroneous cultural heritage work. Fig. 10 – “Coffee Table” by Dusan Kovic 2015. An example of hyper real illustration. This post has taken a look at the history of illustration, photorealism and CGI and their application in the field of archaeology. Debates surrounding the photorealistic products of CGI have prompted the formulation of the London and Seville Charters as guiding frameworks. Due to the time consuming nature of the production of each photorealistic visual, it seems to be suited to a place of public engagement such as a visitor centre, where one authoritative image is preferable, as the results from Frankland’s survey group could suggest (33). Equally, evidence based, photorealistic, non-photorealistic and theoretical ‘roughs’ seem to satisfy the requirement for ‘intellectual transparency’ and methodological rigor amongst the archaeological community(Denard). Whether photorealism is the most appropriate vehicle for the questioning nature of archaeologists remains moot. In my next blog post will explore the power of non-photorealistic illustration as a tool to generate new archaeological knowledge(Terras). The Sketchpad by Ivan Sutherland, 1963. Source: Wikipedia. Fig. 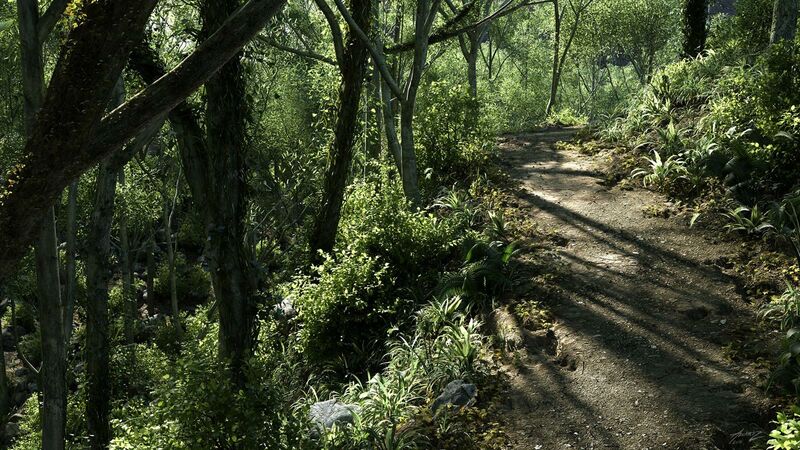 2 – “Forest Path” by Alex Alvarez in Watterson, Alice. 2012.“Hyper-Realism, Photo-Realism and Learning to Be Realistic.” Digital Dirt Virtual Pasts. 17 Aug. 2012. Web 14 October 2015. Fig. 6 – Diorama with Alaskan Brown Bears. Bernard Family Hall of North American Mammals. The American Museum of Natural History. New York, U.S.A. web 14 Oct 2015. Fig. 8 – Digital Karnak Project 2006-2008: A. Visualisation of the possible location of the sphinx statues at the temple’s western gateway during the tenure of the ‘High Priest of Amun’ Pinedjem (21st Dynasty). B. Interior of the visualisation of the ‘red chapel’ of Hatshepsut (18th Dynasty). © UCLA. Fig. 10 – “Coffee Table” by Dusan Kovic.2015.“ I tried to make it as realistic as possible. Modeled in Maya, render in Arnold, composited in Photoshop”(Kovic). Buczynska-Garewicz, H. 2007. Illusions of Virtual Reality. 3D VisA Bulletin 3. Web 7 Oct 2015. Cipolla-Ficarra, F., Veltman, K., Chih-Fang, L. , Cipolla-Ficarra, M., Kratsky, A (eds) 2011 Human Computer Interaction, Tourism and Cultural Heritage: Second International Workshop HCITOCH 2011, Córdoba, Argentina, Sept 2011, Revised Selected Papers. Dwyer, D. 2004. “Beyond the Artist’s Impression: From Photo-realism to Integrated Reconstruction in Buildings Archaeology.” The Reconstructed Past: Reconstructions in the Public Interpretation of Archaeology and History. Ed. John H. Jameson. Rowman Altamira, Google Books. Web 10 Oct 2015. Frankland, T. 2012. “A CG Artists Impression: Depicting Virtual Reconstructions Using Non-photorealistic Rendering Techniques.” Chapter 2 in Thinking beyond the Tool Archaeological computing and the interpretive process, Chrysanthi, A., Murrieta Flores, P., Papadopoulos, C. (eds) 2012 BAR International Series 2344. Gooding, David C. “Envisioning Explanations – The Art In Science.” Interdisciplinary Science Reviews 29.3 (2004): 278-294. Academic Search Complete. Web. 16 Oct. 2015. Rahaman, H., Das, R. and Zahir, S. 2012. “Virtual Heritage: Exploring Photorealism.” Web 8 Oct 2015. Molyneaux, B.L. (ed.) 1997 ”The Cultural Life of Images: Visual Representation in Archaeology.” London and New York: Routledge. Non photorealistic rendering (NPR) is a well tested area as it has its origins in the field of art history and practice. What is new however are NPR computer rendering techniques to make new types of images. This post will explore NPR history as well as the uses of NPR to create new useful types of images in cartography, archaeology, science and medicine and the search for the creation of new meaning and knowledge. NPR, as an area of research, began in the early 1990’s. Computer graphics research was being published in journals by interest groups in fields such as electrical engineering and computer graphics. The Special Interest Group for Computer Graphics (SIGGRAPH) conference began sessions on research in NPR around this time, followed by the first fully dedicated symposium in 2000 (Strothotte and Schlechtweg, xvii). In the present day, every ‘style’ of visual representation is at a person’s disposal. NPR is often a style chosen; not because photorealism isn’t accurate but because in some specific cases, which will be discussed in this blog post, photorealism might not be as useful as NPR. Photorealistic images could be described as ‘complete’ and can fail to convey information as clearly as an NPR image(Strothotte and Schlechtweg, 6). When realism is no longer a goal, other compositional, representational and symbolic factors can come into focus. In Egyptian art, what is depicted does not represent what we could see with our eyes, the human figure is distorted (face and legs are in profile whilst the torso is full frontal). At the same time the borders of these images are filled with hieroglyphs and sometimes animals from nature; represented almost photo realistically and anatomically correct (Fig.1). The purpose of these images isn’t one of accurate representation, instead its aim could be seen as one of high spiritualism through the choice of symbolism and abstraction. Similarly, Picasso’s “Guernica” can be interpreted to have a similar goal, it is said that it acts as a magnifier of emotion and for some, it acts as a symbol representing the whole of the Spanish Civil War (Fig.2). Fig. 2 – “Guernica” by Pablo Picasso.1937. 3.5m x 7.8m. Museo Renia Sofia, Madrid. Kenelley and Kimerling outline how NPR ‘looks at techniques designed to achieve other ends’ in their specialist field; terrain representation in cartography(35-51). In their book, Strothotte and Schlechtweg describe the virtues of drawing by hand; “it is possible to free oneself from physical constraints of reality and to convey an impression rather than just to convey details of a scene’s appearance(4).’ According to Kenelley and Kimerling this would include cartographic generalization, the possible deformations of images and map projections (36).They also mention in particular physiographic diagrams (Fig.3a) as ‘unique stylised renderings’(51; Strothotte and Schlechtweg, 4 ). This (now computer generated)NPR style of illustration includes what could be familiar as the isometric tourist city map.Digital cartography is making efforts to blend what was great about hand drawn maps with digital rendering technology with the use of NPR techniques (Fig.3b). Strothotte, Schlechtweg and Gooding also look at medical and scientific illustration as fields that benefit from using NPR (25; para 53). Gooding outlines how a ‘common feature of all scientific method is managing complexity‘ as ‘not everything is of equal importance all of the time’( para 47). Scientific illustrations are used as a tool to visualise and communicate single or multiple hypotheses at important intervals in the scientific process and therefore ‘illustrating in science is about illustrating process’ (para 53). Strothotte and Schlechtweg discuss how medical illustrations, show how it is sometimes necessary to change the appearance of the object represented to increase clarity. Certain medical illustration conventions apply: Veins are shown as red or blue, ligaments are white and muscles brown. Sometimes an exaggeration of scale is used to show detail of a particular area. ‘Sometimes an organ may be rotated somewhat relative to the other parts simultaneously to provide a better view on all objects in a single image and to be able to study several objects in the context of one another (15). (Fig.5) Whilst some details are highlighted others are left deliberately vague depending on the aim of the illustration. This method is often used for emphasis and clarity in illustrations used for industrial design, user manuals (Gooch and Gooch, 1) (Fig.6), architects sketches (as outlined in BP1) and in archaeological NPR also. Fig. 6 – “Upper Threading”. Singer Sewing Machine Model 327K- Users Manual p12. The archaeological illustrator is sometimes described as the ‘first spectator within the environment of information’ on an archaeological site (Wollheim, 101-2 qtd. in Molyneaux, 1). Even with the introduction of photography, the hand-drawn illustration of sites and finds has remained part of archaeological fieldwork(Fig.7). As for the creation of artistic impressions or photorealistic ‘reconstructions’ of how a site may have looked; the evidence for what every part of a site looked like might not exist (as illustrated by the multiple renderings of the Athenian gates in Eiteljorg’s article (5). Bateman suggests that trying to align our texts and images together is an impossible and false goal (5). A single photorealistic image may look “believable” and still be unable to show the level of detail that exists in the accompanying texts (Bateman, 5; Roussou et al, 1). Roussou et al go further to say that the use of NPR’s might be preferable to photorealistic images ‘to underline the fact that we are not dealing with indisputable facts’(8). In their 2003 article, they outline how a ‘perception of realism’ could be achieved through Photorealism and or NPR with the addition of interactivity (abstract). In reference to interactivity; Eric Champion is cited in Rahaman et al proposing that an end-users engagement with interactive cultural heritage depends only in part on graphic realism(3). Taking into account his experience in computer gaming theory, he is cited as suggesting that static graphic realism is more suited to non-interactive applications and therefore, in his opinion, not computer game environments (Ibid). Fig.7 – Stipple drawing of an Acheulian flint handaxe in Andover Museum (1963.31). Both Strothotte, Schlechtweg and Frankland conducted surveys on the uses of Photorealistic and NPR images (see BP1 for Frankland) (313; 26-27). In 1995, Strothotte and Schlechtweg surveyed 54 architects and architecture students on the uses of 3 types of NPR visualisations (sketch, 3D shaded and exact plot). As well as measuring their types of responses to these images they, like Frankland in 2012, also surveyed their group about which image was considered suitable for what purpose. In the 1995 survey 53% chose the NPR sketch image as a way to present a first draft and the exact plot (NPR) for the presentation of a final design. Frankland’s survey group results seem similar to Strothotte and Schlechtweg’s architects in that they also chose images, in response to survey questions, to fit specific purposes. Whether it could be defined as NPR imagery or not; the use of 3D laser scans taken on archaeological sites, to produce qualitatively rendered models, could possibly allow archaeologists and the public to learn more by recording every stage in the on-site archaeological process(Forte, 3). The overarching idea of being able to make archaeology ‘reversible’ is a very attractive one. The work Forte describes on site in Çatalhöyük is getting close to Strothotte and Schlechtweg’s goal of ‘adding value’ to 2D and 3D imagery through its experiments with interactivity(10)(Fig.8). Fig. 8 – Enhancement of a medical image through edge detection and visualization. Fig. 9 – Teleimmersive session with a Wii: Showing Building 77, 3D model of GIS layers. 2011. It remains to be seen if new NPR techniques such as the laser scans used in Çatalhöyük can allow archaeologists and the public to learn more by recording every stage in the archaeological on-site process (Fig. 9). The great strength of NPR is as a tool to communicate knowledge and convey information (Foley et al. cited in Strothotte and Schlechtweg, 308; Gooch and Gooch, 2). In Cartography, advances in NPR graphics of real world data are creating a blend of meaning making, accuracy and aesthetics. We have also seen how it can be used to record and visually illustrate process and uncertainty with architectural sketches, scientific illustrations and laser scans (Strothotte and Schlechtweg, 317-318). A photorealistic image can convey a vast array of information but a non-photrealistic is the ‘toolkit’ to communicate ideas. Fig. 9 – Teleimersive session with a Wii: Showing Building 77, 3D model of GIS layers. 2011. Gooding, D., C. “Envisioning Explanation: The Art in Science” Chapter1 of Frischer, B. and Dakouri-Hild, A. 2008. Beyond Illustration: 2D and 3D Digital Technologies as Tools for Discovery in Archaeology. BAR Series 1805. Archaeopress. Eiteljorg, H. 2000. ”The Compelling Computer Image – A Double-Edged Sword.” Internet Archaeology 8. Web 7 Oct 2015. Gooch, A., A. 2010. “Towards mapping the field of non-photorealistic rendering.” In Proceedings of the 8th International Symposium on Non-Photorealistic Animation and Rendering (NPAR ’10). ACM, New York, NY, USA, 159-164. Strothotte, T. and Schlechtweg, S. 2002. “Non-Photorealistic Computer Graphics: Modeling, Rendering, and Animation.” Elsevier, Morgan-Kaufmann series in Computer Graphics. 01 Jan 2002. Web 21 Oct. 2015. Evans’ treatment of the Neolithic site of Knossos, when thought of kindly, is now considered part of the history of ideas. His brightly painted columns and fantastically re-imagined frescos were initially dulled down but Knossos remains a popular site amongst tourists(Fig. 4). Its legacy for archaeologists is as an illustration of what can happen when a site is re-imagined from a contempory point of view or when one gives in to the temptation to ‘tidy’ something best left untouched. This blog post will explore the three words in its title; can there be a meeting of all three in cultural heritage? With this aim in mind, this writer will look at some of the ideas expressed about reconstructions of physical sites, the pros and cons, followed by a look the influence brought to bear by the choice of the word ‘reconstruction’. even though they are undoing some previous restoration attempts by replacing cast concrete and iron fixings with carved marble and lead; it could be very close to earning the name ‘reconstruction’. The Abbey on Iona in Scotland (Fig. 4) is another example of a site currently in use although its reconstruction (of only part of the original monastic development)began only in the late 1930’s, followed by occupation in the 1980’s. If you follow the logic of theme parks (built to entertain), it could be said that tourism follows what is available to be seen. As with some virtual reconstructions, when an actual site is not placed in danger, there could be potential there as a useful resource for education and or ‘edutainment’. Informed tourists (in the case of sites like Knossos and The Valley of the Kings in Egypt) might be happier to see Evan’s modernist vision of Knossos or the replica of King Tutankamun’s tomb than to not have access to either. In the case of ‘edutainment’ and theme parks, once the audience understands that there are no claims to authority, then the history can become a thematic background for play or learning. ‘The emphasis on reconstruction […] has been detrimental to the discipline. It is detrimental because it conveys a false sense of knowledge.’(66). Fig. 7 Reconstruction of doorway to temple mount with multimedia information panel, 2004 created by Jepson, B. and Snyder, L.
Fig. 8 Pyramid B at Tula, Mexico, by Jorge Acosta,1941. Reconstructions places directly on top of archaeological remains makes those remains inaccessible for future study. The same argument was made retrospectively against the addition of strategic covers to parts of Michealangelo’s nudes in the Sistine Chapel; better to do nothing if something is irreversible. Stanley-Price presents the Pyramid B at Tula, Mexico, as restored by Jorge Acosta and placed beside the original remains in 1941(39).This juxtaposition, in a place where there are no standing remains, creates a strange spatial relationship with the originals and may not be an positive addition to the site(Fig. 7). It is not likely to be possibe to reconstruct a site to one time period. An example of a site not ‘reconstructed’ for this reason is Trim Castle, Co. Meath (Fig. 8). Instead of being reconstructed, the castle remains mostly a ruin but there are scaled architectural models on display showing what archaeologists believe the castle looked like at three different stages in its history(based on evidence). Un-reconstructed interior with walkways and scale models on ground floor (in white). Nicolas Stanley-Price and Jeffrey T. Clark both assert that the idea of reconstruction has been a part of archaeology for a very long time(32,63). It is an attractive idea; like time travel, but unfortunately not one of those imaginative projections that could ever become fact because we lack the evidence to fully know what life in past times was like. Our tangential connection to past cultures comes through found structures and the ephemera they left behind. All else is conjecture, comparison and the quest for more. As for the validity of the word ‘reconstruction’: If we know how much we don’t know, then why set the goal so high by naming our end goal with words that cannot match what the remains point to? (Taylor, W.W. qtd Clark, J.T., 63) The word ‘reconstruction’ therefore sets an impossible expectation of something, like the title of this post; complete, authentic and true. Jeffrey, S. 2015. “Challenging Heritage Visualisation: Beauty, Aura and Democratisation.” Open Archaeology 2015; 1: 144–152 DOI 10.1515.
presenting ambiguity, alternatives, and documentation in virtual worlds”. Architecture: Automation in Construction. 13, 2 March 2004. 175-186.
by Alison Richmond and Alison Bracker Publisher: Elsevier Year: 2009. Fig. 2 The London Charter Homepage. This blog post will outline and evaluate how the London Charter has been used and to speculate about why it is not used. In a show of hands at the VHN conference (Maynooth 2015) eight people(out of perhaps thirty) said that they had used the LC as part of their work process. Pat Tanner of the University of Southhampton who presented a paper at the conference said that he had used it as part of his work on the restoration of a medieval ship and that it’s principles were in line with how he expected his decision making process would need to be documented (paradata). In his case his craft (boat building) and boat reconstruction are so closely related that he could probably link every decision in the reconstruction process to a logical reason in boat craftmanship. (Fig. 3 and 4). Fig. 3. 3. Newport Medieval Ship. Pat Tanner. Levels of Uncertainty illustrated using a colour coded key to the line colours. Visualising levels of uncertainty seems to be the most visibly used principle (Heading 3 – Research Sources) of the London Charter (Hann, 117; Tanner, 25; Wittur and Krömker, 90). This sort of thought process, Fig. 5 ,and it’s resulting illustration (as shown before in my blog on Photorealism and in Fig. 6 + 7 here) where the parts of a reconstruction are uncertain are illustrated as more faded than parts that are extant, was a method used to show uncertainty before the London Charter was written in 2006 (Eiteljorg,5). These kinds of Non Photorealistic Renderings (NPR) are practical where uncertainty needs to be visually underlined and as Tom Frankton’s survey group suggest, a photorealistic image is what they expect to see in Visitor Centres and by extension; films and documentaries. Fig. 5 -Wittur and Krömker. A simplified example to show the decision making process based on sources and inferences for a 3D visualisation of the towers on Lorsch Abbey in the 11th Century. Fig. 6 – Entrance to the Athenian Acropolis with no indications of uncertainty. Other parts of the Charter refer to an open access agenda (Principle 6) which may or may not serve the aims of all cultural heritage visualisation projects. Projects collecting the data of existing monuments in the landscape such as The Scottish Ten(http://www.scottishten.org/) and 3D Icons projects (http://www.3dicons.ie/ ) make no public reference to a specific charter that they use other than technical ones and are not likely to choose to use the LC. Both of these projects, no doubt, have procedures for long term digital preservation of their data for future use but there is probably no need to record the decision making process that goes into creating their 3D visualisations because perhaps they don’t have a hypothesis to test, the original still exists. In their paper, “Lorsch Abbey and the London Charter – an Information System for a World Heritage Site”, Wittur and Krömker say of the LC: ‘It needs to be suited for sites with heterogeneous and sparse sources, which heavily rely on the interpretation and the possible combination of information.’ This point seems to be substantiated (based on the projects found whilst researching this post) by the types of projects that use the LC. These projects made visualisations of sites with areas of strong ambiguity about what was once there (Wittur and Krömker; Hann; Tanner). This might suggest that the LC is not seen as useful where a visualisation is being made of extant heritage sites but useful where a site is incomplete and a hypothetical visualisation is seen as complementary whilst defining where there are areas of factual uncertainty. Papers such as the one written by Juan M.Carrillo et al give an indication of how the LC could be similar to frameworks used in the fields of science and engineering. They compare the LC to software engineering requirement standards and propose that it could be a suitable template for an e-archaeology requirement standard working with born digital data (207). This suitability is made even clearer when considered alongside the subjectivity of post-processual archaeology (Wikipedia) as well as the subjectivity of the artistic process involved in producing a visualisation. This writer suspects that if a number of visualisers were each given identical data, the visuals produced could be very diverse depending on the interests, style emphasis, taste and visual nuances of each visualiser. Many visualisers + Same data = Many versions of image based on same data. Bateman (5) suggestion that we cannot make our academic texts align fully with our visuals could be seen as another perspective on the same point. In their book “Non Photorealistic Rendering”(NPR) Gooch and Gooch assert that NPR may be preferrable to hyperrealism because it can ‘underline the fact that we are not dealing with indisputable facts’. Meanwhile the question that the LC cannot answer is, can a good image become a good argument? (Eiteljorg, 4). If, as the preamble to the LC says, a finished image alone does not reveal it’s secrets. This writer believes that perhaps the paradata can. Fig. 3 – Newport Medieval Ship. Pat Tanner. Levels of uncertainty illustrated using a colour coded key to the line colours. Source: p25 Tanner, P. 2013 Newport Medieval Ship – Reconstructing the Hull Shape – Minimum Reconstruction. Web 21 Dec. 2015. Fig. 6 – Image of the entrance to the Athenian Acropolis with no indications of uncertainty. Bateman, J. 2000. “Immediate Realities: An Anthropology of Computer Visualisation in Archaeology.” Internet Archaeology 8 .Web 7 Oct 2015. Beacham , R.C., Denard, H., Baker, D.2010. ”Virtual Presence and the Mind’s Eye in 3-D Online Communities” http://www.int-arch-photogramm-remote-sens-spatial-inf-sci.net/XXXVIII-5-W16/461/2011/isprsarchives-XXXVIII-5-W16-461-2011.pdf. Web 27 Dec 2015. Bentkowska,-Kafel, A., Baker, D., Denard, H.2010 ”Digital Research in the Arts and Humanities: Paradata and transparency in virtual heritage”. Burlington, VT;Farnham, Surrey, England;: Ashgate, 2012. Web 16 Dec 2015. “I bought a piece of Roman furniture on the Internet. It’s quite good but low on polygons.”—Digital Visualization of Cultural Heritage and its Scholarly Value in Art History”. Review 5.11 (2014): 34. Web 19 Dec. 2015. 10.4995/var.2013.4275. Web 22 Dec. 2015. =12309. Web. 29 Dec. 2015. London. Paper. Web 27 Dec. 2015. Archaeology.” Chapter 3 in “Paradata and transparency in virtual heritage”. to Be Realistic.” Digital Dirt Virtual Pasts. 17 Aug. 2012. Web. 18 Apr. 2015. 10.1109/VSMM.2009.44 Web 24 Dec. 2015.